4. Leave your name, email, and a link to your Chicnova wishlist! GOOD LUCK!! This giveaway will be open until September 13th! And the winner of the previous Black Sheep Giveaway is Rachel of Swell and Stylish! Woohoo, thanks again! The top is adorable, can't wait! You can't really "link" to your wishlist...but I made one! Following on Bloglovin and liked all on fb. thanks! Liked ChicNova and Moptop on Facebook. Great giveaway thank-you! 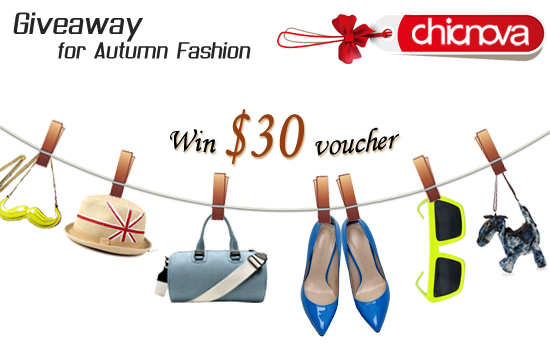 I'd love some goodies from Chicnova! Yey! :) i love your blog and the giveaways in your blog! I follow you at bloglovin and liked your facebook page! I do not now how to put here my wishlist but I love this competition!Great! Thanks for this giveaways! Xoxo! Yay! Follow you via Bloglovin, Like Chicnova on Facebook, and I like the Moptop on Facebook! Here's a wishlist item: I LOVE the Loose Black Vest Dress with Strap Back!!! Follower of The Moptop, and liked Chicnova and The Moptop on Facebook! I liked the facebook pages. Can't believe I hadn't already liked yours! Thanks soo much for this chance!